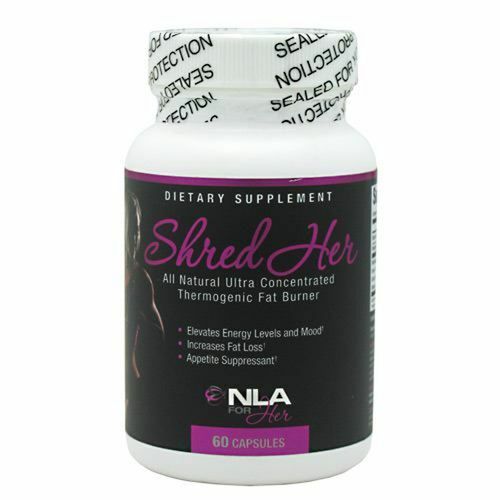 Shred Her from NLA for Her utlizes ingredients like green tea extract, raspberry ketones, guarana and more. Advertências: Do not exceed recommended dose. Pregnant or nursing mothers, children under the age of 18, adults over the age of 60, and individuals with a known medical condition should consult a physician before using this or any dietary supplement. Product contains caffeine and naturally occurring caffeine, which may cause restlessness and sleep difficulty in some sensitive people. Keep out of the reach of children. Notas: This product contains ingredients derived from milk and soy. This product is manufactured in a plant that processes milk, soy and shellfish. Recomendações de uso: Take 1 pill immediately upon waking and 1 additional pill 3-6 hours later to ignite your metabolism and to keep your body in a thermogenic, fat burning state all day.